Writer/director Danishka Esterhazy has been working in the trappings of genre film for her entire career but it's taken eleven years for Level 16, her first foray into science fiction, to see the light. Set in an undisclosed time that is either today or years in the future, Level 16 stars Katie Douglas and Celina Martin as Vivian and Sophia, a pair of young women we first meet as girls. They're living at The Vestalis Academy, a boarding school for orphan girls who are being trained for adoption into wealthy families when they turn into young women. The headmistress, Miss Brixil (Sara Canning) runs a tight ship, including having a group of black-clad security guards who help her keep order. When Vivian arrives on Level 16 for the first time, her final level of training, she is re-introduced to Sophia who tries to make amends for their mishap years earlier by warning her about the truth of the Academy. Sophia is convinced that there's more going on than girls being prepared for adoption and with Vivian's help, the two discover the truth of what Miss Brixil and Dr. Miro (Peter Outerbridge) are really up to and then set off to save themselves and the other girls. Level 16 feels like a leap forward for Esterhazy who has been making smaller indie features and short films for years. It was apparent early on that she had great vision and a keen eye; it only takes seeing one or two of her short films (The Red Hood and The Snow Queen are particularly good) to note that she has talent and a way with actors but Level 16 feels far more polished than her previous work. The combination of cinematography from Samy Inayeh (who also shot the gorgeous The Last Will and Testament of Rosalind Leigh (review)), production and sound design finally meet the level of quality of Esterhazy's storytelling and the talent of her cast which shines even brighter than usual. Canning is challenged with taking on a complex character whose motivations change almost entirely on screen in one scene and unsurprisingly, she is more than up to the challenge. Douglas and Martin, who have previously appeared in small television roles, both show that they are more than capable of handling complex characters and motivations though Douglas has the more difficult task with Vivian who is written as a strong character with an almost unflinching drive for survival. At first she comes across as selfish and uncaring; a gamble on Esterhazy's part considering it's difficult to sell a movie with an antihero, but Douglas manages to infuse the character with a humanity that keeps the audience emotionally engaged with the story and eventually even rooting for her success. 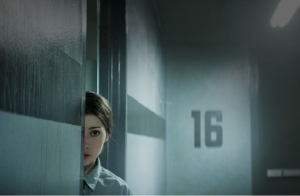 Though the comparisons to "The Handmaid's Tale" are likely to arise, Level 16 is an altogether different beast. At its core, the two projects share a common theme of women fighting oppressive organizations but, thankfully, in the case of Esterhazy's film, there is some hope at the end of the story. Level 16 is currently playing the festival circuit including one more screening at VIFF.